The health package testing industry exists for one reason: medical device developers and pharmaceutical manufacturers can easily fail to notice risks that lie beyond the specifications of the product itself. We meet clients all the time who are apologetic or sheepish due to an overpack-related fail. We say you should feel no shame; and we’ll tell you why. We’ll also show you how to avoid overpack fails, and share tips for a sound approach from first wrap to the right overpack. Imagine yourself as head chef at a newly-recognized Michelin three-star eatery. As the dinner hour gets under way, you are laser-focused, preparing plates of your innovative new Oysters Mignonette recipe to wow the diners. Everything seems perfect and you love your job. What you don’t know is that the refrigeration unit on the truck that delivered the oysters was failing and the prep staff who took the shipment didn’t notice the oysters weren’t cold. And then there is the parsley you are sprinkling over the pasta. Bright, crisp and contaminated with E. Coli. For all your vision, skill and good intentions, you are unknowingly serving up serious health risks. When a diner gets sick and it comes back on your three star achievement, what then? This illustration is a case and point of “what you don’t know CAN hurt you.” As the head chef, you were unaware of the issues, but still flirting with disaster. Now, let’s come back to our real lives, where oysters are medical devices and parsley is a life-saving drug. Food poisoning is bad. Compromised sterility and other medical risks can be deadly. And this time, here you are with a breakthrough medical device nearing production. 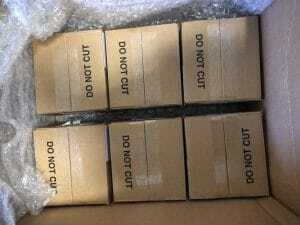 Your team has packed up 60 samples and shipped them to Packaging Compliance Labs for testing. You have no idea the corrugate overpack you ordered is too lightweight for the job. This is where your oysters get warm. The damage occurred en route to the lab, so these cartons and their contents arrived, potentially unsuitable for testing. 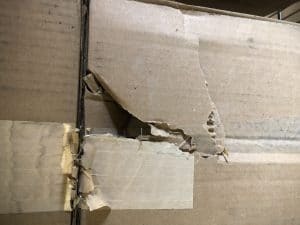 We call you with the bad news: some (or all) of your boxes arrived damaged. We discuss your options and potential consequences. Your testing may have to be rescheduled—we have you scheduled, but may or may not be able to use the samples. Your shipping materials have to be upgraded before you ship replacements. What if replacement samples don’t exist? What kind of testing was originally ordered? If this is final shipping state and transit or aging studies were ordered, you’ll be starting over. If the overpack was incidental only to getting the contents inside to the lab, we’ll discuss how to ensure iron-clad results, which may or may not allow this batch of inner packages to be tested. Substandard overpack scenarios are avoidable. If you don’t have an in-house packaging engineer, find one—a good one, who knows your industry (we know some). Do this early! Have your new expert design (or at least review) the entire packaging plan for your device or drug. This is not an admission of weakness or lack of knowledge. It is quality assurance and a driver of speed to market with confidence. Here is an example of what proper overpack might look like. Each layer is designed around your product specifications. You weren’t running blind and have full confidence that your product launch will be something to celebrate. 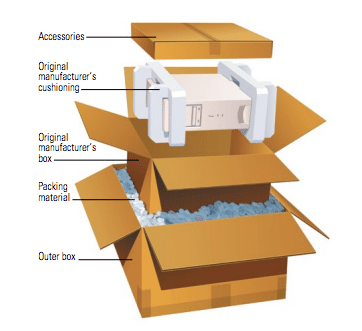 Allow packing material to protect the contents by planning space on the bottom and top of the overpack container. 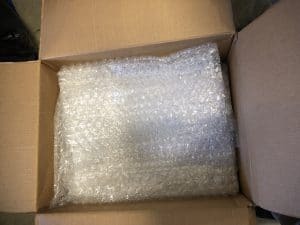 Plan for packing material (i.e., bubble wrap as shown) placed between inner boxes, and along edges of the overpack container. Don’t “stuff” as many inner boxes as possible into the overpack container. Opt for more room to protect. Overfilled overpack and content weight can make the overpack ineffective. 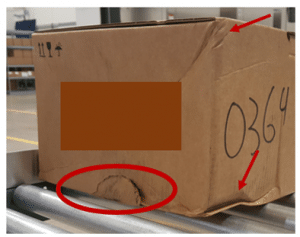 Stress reliever: While bad things DO happen, damage to the overpack container does not always have a negative effect on inner contents, but this must be verified. Build in extra protection even when sending palletized shipments. This ensures that when items are palletized, stacking does not result in crushing the bottom layer. Source quality materials, such as tight-wrapping plastic, corner boards to protect box edges. Label “DO NOT STACK” whenever cone shaped contents exist if at all possible. In the alternative, include clear labeling that shows the contents are fragile. Overpack is just one example of myriad aspects of packaging that require knowledgeable attention to protect your product, promote patient safety and promote a profitable MD or pharma launch. No wonder you didn’t think of it! It’s not your job. Let us know if you need help. We meet clients all the time who are apologetic or sheepish due to an overpack-related fail. We say you should feel no shame; and we'll tell you why.